Hello everyone, welcome to our site where we can all sit around and talk about the brews we have had. We are just your common everyday guys that decided to start a forum on beers we liked, disliked or have yet to try. A couple of us live in California and I live in Las Vegas. We hope to start a forum on all different topics. All the way from the brewing process to the finished product will be discussed in this forum. Please take the time to look over our website as new posts and topics will be continually added. Any comments, ideas and recommendations are always welcome by replying to our post and pages. Noah – Hey guys this is Noah. I have known Tony for over 25 years and when he asked me to be a part of this site I jumped at the chance. The reason I love beer is simple. It is one of the most complex and beautiful things on this planet. Folks will tell you that wine is much better for variety and complexity, but I will tell you that they have never had an Imperial Stout Barrel Aged in a whiskey barrel or a wonderful Belgian Tripel. I occasionally brew my own beer too and can’t wait to share some of those stories with you as well. Last but not least I am one of the hosts on Off The Rails Podcast where we talk about anything and everything. 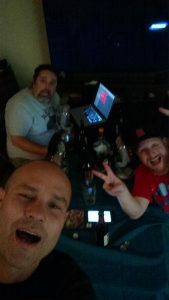 We review one beer an episode and we will be posting an exclusive review for TalkingHops.com from time to time. Check those out here.